While the Atlantic basin is expected to be active this summer and fall, the threat level for New Jersey is highly uncertain. A tropical system becomes a named tropical storm when maximum sustained winds reach 39 mph. A storm is upgraded to a hurricane at 74 mph, and a major hurricane at 111 mph. 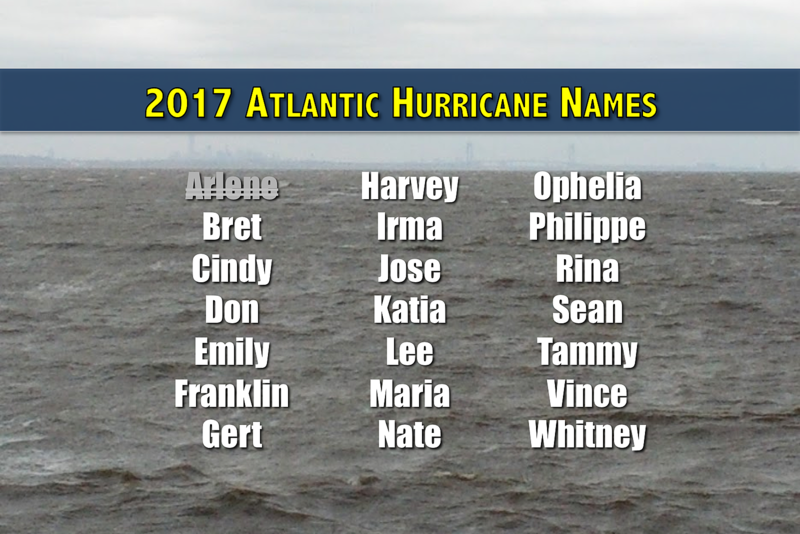 As usual, the 2017 lineup of hurricane names is culturally diverse and alternates between traditionally female and male names... Arlene, Bret, Cindy, Don, Emily, Franklin, Gert, Harvey, Irma, Jose, Katia, Lee, Maria, Nate, Ophelia, Philippe, Rina, Sean, Tammy, Vince, and Whitney. Hurricane names operate on a repeating six-year cycle. In other words, the 2017 list was also used in 2011, with one important exception. Irene was retired as a tropical storm name due to the damage and death toll the storm caused from the Caribbean to the Bahamas to the United States (including New Jersey, of course). The World Meteorological Organization replaced Irene with "Irma" starting with the 2017 season. So what's the outlook for the 2017 hurricane season? There's nothing of note swirling in the ocean at the moment. Things got off to an early start in the Atlantic basin, with a rare April tropical storm named Arlene. This was a "fish storm," which never threatened any land or people as it circled the middle of the Atlantic Ocean. In the meantime, experts have called for an above-normal hurricane season. As you may know, I'm not a huge fan of seasonal forecasting, and it's certainly not my personal area of expertise. Having said that, I think it's fair to make general statements about long-term expectations. And in this case, experts are saying that conditions across the tropical Atlantic are conducive to active hurricane formation this summer and fall. I'll buy that. However, taking this general forecast and localizing it to assume what New Jersey might see from this tropics this season is completely inappropriate and inaccurate. You just can't extract that level of detail from a seasonal forecast. It's beyond the science. And therefore, frankly, such a forecast reeks of "hype".